Was your property flooded by water from the Addicks or Barker reservoir? Our court-appointed lead counsel for Individuals (not class action) will give you a Free Consultation about your constitutional property rights. You may be entitled to significant compensation in the court case against the federal government that is currently pending. The Test Case trial begins May 6, 2019. The federal government designed its Addicks and Barker dams and reservoirs to flood thousands of private properties in the event of a large enough storm. That is exactly what happened during Harvey, when over 7,000 acres of private property behind the dams (“upstream”) were flooded due to the government’s project. 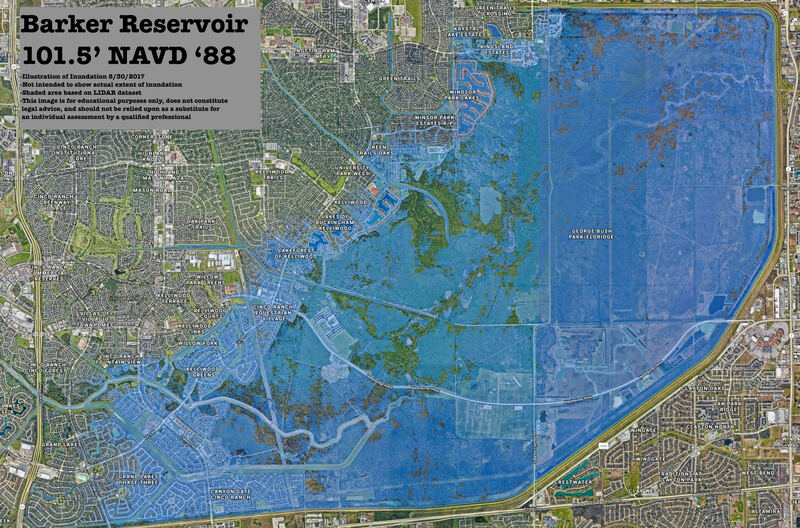 Following Harvey, the federal government created maps illustrating which private properties were flooded by its project as of August 30, 2017 (see above). Addicks reservoir flooded communities including: Lakes on Eldridge, Twin Lakes, Concord Bridge, Charleston Colony, Concord Colony, Bear Creek, Pine Forest Village, Savannah Estates, and Georgetown Colony. Barker reservoir flooded communities including: Canyon Gate, Cinco Ranch, Grand Lakes Phase Three, Kelliwood Greens, Kelliwood Park, Willowfork, Kelliwood Lakes, Cinco Ranch Equestrian Village, Lakeforest of Kelliwood, Lakes of Buckingham Kelliwood, Green Trails Oaks, Windsor Park Estates, Windsor Park Lakes, and Kingsland Estates. If you would like a Free Consultation, please contact us and ask to speak to our court-appointed counsel. In a blow to the government’s arguments, Judge declines to throw Upstream cases out of court. Some clients of VB Attorneys at the Houston Federal Courthouse for May 16, 2018 hearing. The Judge concluded his Order by stating he is deferring any ruling on the motion to dismiss until trial. We continue to feel very good about our position that the cases should not be thrown out of court. At the hearing, the Judge also discussed the case schedule. The Judge indicated the upstream test cases will go to trial in February 2019. This is still an expedited schedule, which is great news for all upstream flood victims. The Judge was asked at the hearing if he is inclined to certify some type of class action in the upstream litigation, and his response was: “I’m not.” The Judge cited several “problems” he sees with addressing this litigation through a class action. In the May 24 Order, the Judge further confirmed: “The proceedings in both of these sub-master dockets have followed the pattern used for multi-district litigation.” This litigation is continuing to move forward as a group of individual cases, and not as a class action. 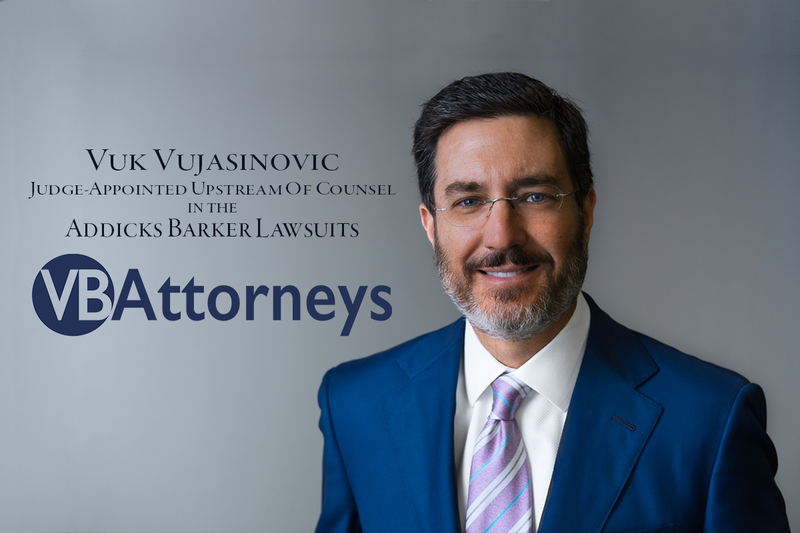 Vuk has been recognized by Super Lawyers magazine for his work after Harvey. 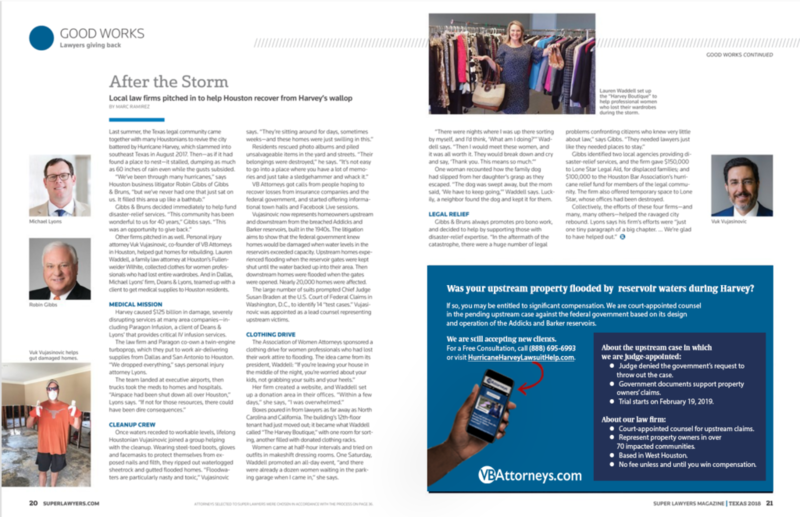 The magazine spoke with Vuk and several other attorneys from Houston who volunteered their time, resources, and experience to help people in need. In the article, Vuk talks about helping people gut houses and clean up after the storm. He says, "Floodwaters are particularly nasty and toxic... They're sitting around for days, sometimes weeks – and these homes were just swilling in this. Their belongings were destroyed. It's not easy to go into a place where you have a lot of memories and just take a sledgehammer and whack it." On Thursday, March 22, 2018, the New York Times published a powerful video story featuring one of our clients, Lisa Perez. Ms. Perez lives in Cinco Ranch Southpark, and her home was flooded by waters backing up from the Barker reservoir. The federal government could have purchased these properties, but chose not to, paving the way for the area to be fully developed with private residential homes. Sadly, the story doesn’t end there. 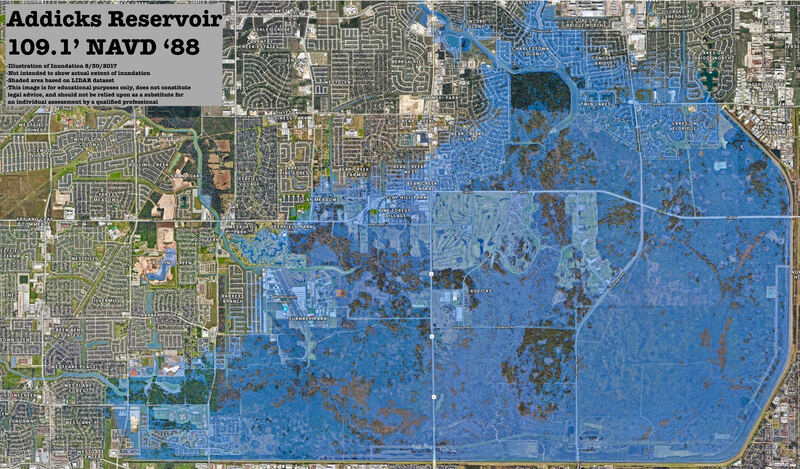 The federal government actually predicted in the days before peak flooding that over 15,000 private properties upstream of Addicks and Barker would flood due to the design and operation of those reservoirs, impacting almost 50,000 people. The government’s projection was correct, as this is precisely what happened as of August 30, 2017. Inexplicably, the federal government chose not to tell the public about its projections, robbing our community of any reasonable opportunity to at least save some valuable personal possessions before the destructive reservoir waters washed them all away forever. On Monday, March 5, Vuk Vujasinovic, judge-appointed of counsel in the Addicks Barker litigation, gave an update on latest case developments and answered questions, via Facebook Live. Click here to access a video of this presentation. Why hire VB Attorneys for your flood claim? Chief Judge Braden went on to specify that Mr. Vujasinovic satisfies “the criteria for selection, set out in the MANUAL FOR COMPLEX LITIGATION (4th ed. 2004) and MDL Standards and Best Practices, DUKE LAW SCHOOL CENTER FOR JUDICIAL STUDIES (Sept. 1, 2014).” The Order pertains to pre-trial jurisdiction discovery, the government’s motion to dismiss per certain court rules, and scheduling, and was entered in an upstream track of the litigation. VB Attorneys is proud to have been appointed to this lead role in the litigation, and we are eager to continue our hard work protecting our clients’ property rights. Chief Judge issues calendar of deadlines (first case deadline is December 8, 2017). 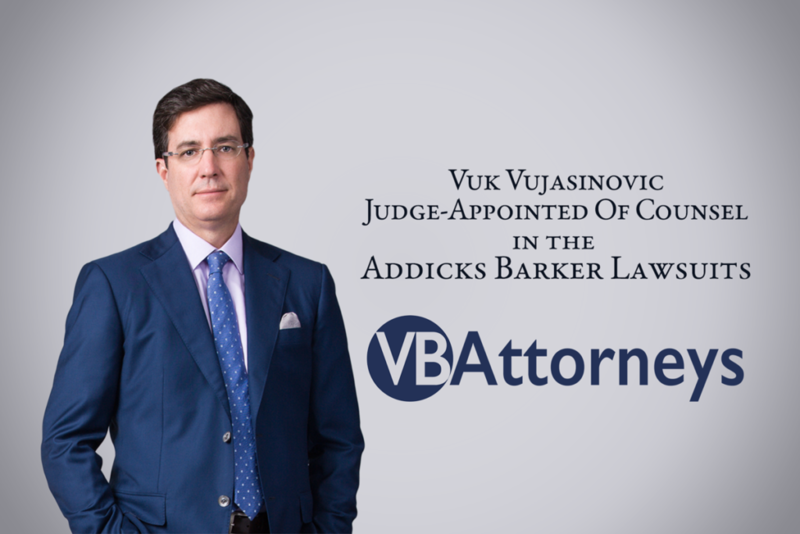 Chief Judge appoints leadership counsel to lead the litigation, including Vuk Vujasinovic of VB Attorneys. 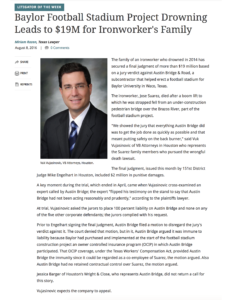 Chief Judge establishes two litigation tracks: downstream and upstream. Projection issued of 10,000 to 16,000 flood victims owning property upstream. Projection issued of 4,000 to 5,000 flood victims owning property downstream. Collective financial losses projected to exceed $1 Billion. Do you own a home or business that was flooded by reservoir waters? If so, you qualify to be included in our group of clients who are asserting their constitutional right to be compensated by the government for “taking” their property. We are accepting clients with properties downstream and upstream from the Addicks and Barker reservoirs. We are filing claims for a group of individual clients who will receive personalized attention. On October 2 and December 5, 2017, we filed Complaints in the U.S. Court of Federal Claims on behalf of our large group of our clients seeking just compensation for the flooding of their properties by reservoir waters. We are continuing to accept clients. We work on a contingency fee, so you do not owe us anything unless and until we win your case, at which time we would be paid a portion of your winnings. You have nothing to lose. For a free consultation, complete the “Contact Us” form on this website. You may also call us at (888) 695-6993 or come see us at our offices in West Houston. The Harvey inverse condemnation cases will likely turn in large part on the science of surface water resources engineering, hydrology and hydraulics. Our firm happens to be on the current forefront of these very hydrographic issues that will be presented by these Hurricane Harvey claims lawsuits based on work we did on a case last year in which we obtained a verdict of $17,720,000, resulting in a judgment of over $20,000,000. According to the Texas Lawyer, this was among the largest verdicts in Texas last year. 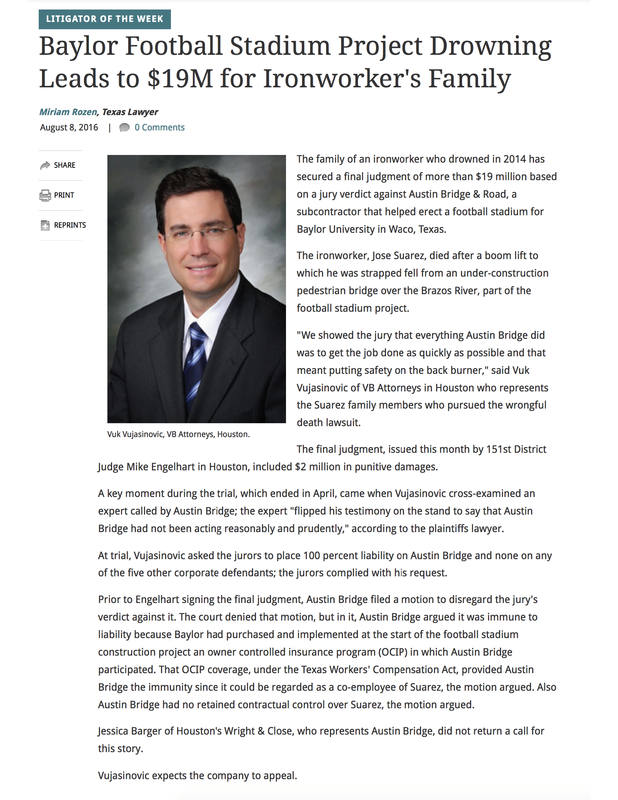 That case involved a fatality during construction of a bridge over Lake Brazos as part of the new Baylor football stadium project. One issue involved the application of marine law. This required us to analyze issues concerning reservoir use, water surface elevations, water flow levels, stream gages, USGS gage data, navigability, and passage of water over and through a dam. These are precisely the issues we are currently analyzing with respect to the downstream release and upstream accumulation of water from the Addicks and Barker reservoirs. The dam in that case was even operated by the same government entity that operates the Addicks and Barker facilities: the U.S. Army Corps of Engineers. We hired and worked with a registered civil engineer expert with over 30 years of experience in water resources engineering, modeling and evaluation of surface water resource systems, forensic hydrology and hydraulics, and alternative flood control measures. Our expert prepared a detailed hydrographic analysis for us, reducing it to a report. We are conducting the same kind of hydrographic analysis in our cases concerning the downstream release and upstream accumulation of water from the Addicks and Barker reservoirs. We are uniquely equipped to do so because we conducted the same analysis as recently as last year in a very significant case. This benefits our clients because we already know how to confront these issues, which greatly increases our chances of success, and also saves costs because there is no need to re-invent the wheel. The firm's founders, Vuk Vujasinovic and Brian Beckcom, have each been practicing law for approximately 20 years. Vuk and Brian are both Board Certified in Personal Injury Trial Law by the Texas Board of Legal Specialization, and have been so certified for over a decade. In fact, three of the six lawyers at the firm hold this certification. The firm is highly experienced in handling large, high-stakes civil cases for large groups of clients, with an established track record of success. What must be proven to win this kind of takings or inverse condemnation case? There is legal authority under the constitutions of the United States and Texas, and under federal and state case law, that you have a potential “takings” claim (also called “inverse condemnation”) if the government chooses to flood your property, even if the flooding is temporary. You do not have to claim or show that the government did anything wrong. The government sacrificed your property for the greater public good, and you have the constitutional right to be compensated by the government because you took this bullet for the community. Challenge what the government must show: The "benefits of the [reservoirs] to each tract of land on the whole offsets the damages suffered to the individual tract under the relevant benefits test of [another case]." So the bottom line is this: these claims are analyzed by courts on a fact-intensive case-by-case basis. Courts will look at where your neighborhood is located, which street you are on, as well as your specific, one-of-a-kind address. We are going to work with our experts in trying to establish a takings case for each case we accept, no matter where our client's property is located within the inundated areas. Our law firm is based on the west side of Houston, and most of our lawyers and other employees live in this area. 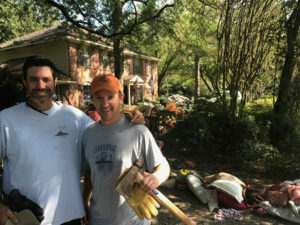 Our firm's founders, Vuk Vujasinovic and Brian Beckcom, live with their families in west Houston. We have had a first-hand look at the devastation caused by the flooding brought on by Hurricane Harvey, and by the government's release of the Addicks and Barker reservoirs. Most of us suffered losses in the flooding. We have been busy helping our families, friends, and fellow citizens gut their homes to prevent mold so they can hopefully re-build. Vuk grew up in Kingwood, an area also hit hard by flooding, and still has close family and friends there. One of the main items we must prove in these kinds of cases is that the government knew your property would be among those inundated with water and damaged by the release of water downstream from the Addicks and Barker reservoirs or by the accumulation of water onto private properties upstream. We are uncovering evidence supporting these claims. the decision on when and how much to open or close the dams is a team effort of the” USACE.